The Second Berkeley Dulcimer Gathering! Quality music education on the dulcimer in the Heart of Berkeley! At the Berkeley Dulcimer Gathering you choose three out of ten classes taught by teachers with more than a century of experience combined. The day is planned for maximum time in community with up to 75 mountain dulcimer aficionados. Some dulcimers will be available for loaners and to purchase, too! Registration entitles you to three classes. Once you register, you’ll receive an email from berkeleydulcimergathering@djhamouris.com to select one for each class period. Steve Eulberg: String Side Up (Beginner) Absolute Beginning workshop for getting started playing Mountain Dulcimer. Heidi Muller: Singing with the Dulcimer (Intermediate) Learn how to accompany your singing with chords and harmonies. We’ll also look at how melody can be used as an introduction, instrumental break and ending. Songs will include “Banks of the Sacramento,” “Farther Along” and more. Deborah Hamouris: English Country Dances (Intermediate) These lively tunes are from the living tradition of country dancing as practiced in both Britain and “the colonies”. We’ll learn at least one simple and another more intricate tune in keys that are used by contemporary dance bands. Fun to play and even more fun with dancers! Bob Webb: Weaving Melodies Into Your Arpeggiation (Advanced Beginner) Arpeggiation is a fancy word for ‘breaking up the chord into its individual notes.’ In this class, instructor Bob Webb will teach you how to use your flatpick to bring out the melody of a song as the chord progression goes rolling along. Once these techniques are learned, you will be able to choose a song and give it that lush arpeggiated feeling. Heidi Muller: Simple, Smooth & Steady (Beginner) Pick up good habits, smooth out your playing and become a better strummer. We’ll practice on some good toe-tapping mountain tunes in DAD like Groundhog, Sandy Boys and more. Bob Webb: Chord Shapes and Capos (Intermediate) Learn the underlying principles that will free your left hand from being chained to the lower end of your fretboard. Instructor Bob Webb will demonstrate the four basic chord shapes as they progress up the fretboard. He will also show how chord positions relate to playing with a capo when it is placed on the 1st, 3rd, and 4th frets. Learn how to play songs and chord progressions in the keys of E minor, G major, A major, and A minor. Steve Eulberg: Playing Bluegrass on Mountain Dulcimer (Intermediate) (Chop chords, walking basslines, licks and high harmonies) One reason dulcimers are not always welcome in a jam is that we haven’t developed the necessary “chops” to support and play in the style that is called for. Jam Room Open for All! Heidi Muller: West Virginia Fiddle Tunes and Songs (Intermediate) Learn some toe-tapping, old-time music from West Virginia’s fiddle tradition. We’ll play tunes from the Hammons Family, Wilson Douglas and others, using traditional strumming and hammers, pulls and slides, and try out a song or two. Bob Webb: The Zen of Rhythm (Beginner) Get in touch with your inner strummer – find the right strumming pattern for virtually any style of music as you learn to feel the beat of your own inner rhythms. Instructor Bob Webb will teach strategies to help you strum chords and play melodies with greater confidence. He will bring pre-recorded audio percussion tracks to practice with, as well as tabbed songs in various styles. If you have ever had difficulty practicing with a metronome, this class will help you get around that problem, and make playing with a group more fun. Intermediate: You have the skills of the previous levels and you’ve learned the basics of strumming and reading tablature, you need to expand your playing techniques and musical theory. Learn to embellish your basic music with hammer-ons, pull-offs, and slides; to adapt an arrangement with different chord positions; to play in and modulate to different keys with and without a capo or retuning; to flatpick and fingerpick a tune. You can play in different tunings. Heidi Muller discovered the mountain dulcimer over thirty years ago. While living in Seattle, she performed as a singer-songwriter, guitarist and dulcimer player and taught dulcimer workshops across the Northwest and down the West Coast. Later, in West Virginia, she taught dulcimer and guitar in schools and residency programs and became a popular instructor at events including the Northeast Dulcimer Symposium, Augusta Heritage, Kentucky Music Week, Dulcimer Chautauqua, Gebhardt Woods, Dulci-More, and Ohio Valley Gathering. 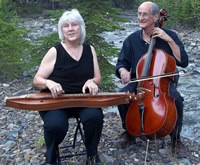 Described by Dulcimer Players’ News as “one of the dulcimer community’s best songwriters and performers,” Heidi has released 8 CDs including the new Dulcimer Moon with her partner Bob Webb. Her tune “Leaving the Methow” appears on the Masters of the Mountain Dulcimer, Vol. II CD and she has published several dulcimer songbooks. Heidi lives in Enterprise, Oregon, where she and Bob co-host the annual summer music camp, Dulcimer Week in the Wallowas. Bob Webb started playing cello at age 7 and picked up mandolin, guitar and mountain dulcimer over thirty years ago. He taught music in private schools and summer camps in West Virginia and created his own scheitholt-style cardboard box dulcimers, which he taught over 700 people to make and play. He has published a beginning dulcimer book and made CDs with both Heidi Muller and Dave Haas. Bob has taught at Augusta Heritage, Knoxville Dulcimer Retreat, Kentucky Music Week, Central Florida Dulcimer Festival, Ohio Valley Gathering and the Great American Dulcimer Convention. For nine years, he was a member of the house band for the NPR show Mountain Stage, where he accompanied artists such as Odetta, Tom Paxton, Shawn Colvin, Bill Staines and Arlo Guthrie. He lives in Enterprise, Oregon where he teaches and engineers album projects and public radio documentaries in his own recording studio. Steve Eulberg: 5-time national mountain dulcimer winner, 3-time national hammered dulcimer finalist, Steve Eulberg weaves old-timey with blues and contemporary tunes adding original songs into a tapestry of “smile-inducing, toe-tapping folkgrass” that captivates and energizes audiences of all ages. Steve's music has been featured on United Airlines’ Inflight Audio, PBS’s Roadtrip Nation and National Public Radio. An active touring musician, film and theater composer, he has had two recordings on initial Grammy ballot and several songs in the Top 10 Independent Country Chart reported by The Music Review. Founder of the Colorado Dulcimer Festival he served as Secretary-Treasurer of Local 1000, the non-geographical local of the AFM, specifically created for traveling musicians. His elementary school programs are engaging, informative, uplifting and fun! He teaches guitar at www.jamplay.com and is co-owner of www.dulcimercrossing.com where he teaches people to play both mountain and hammered dulcimers. Deborah Hamouris (DJ to her friends) is a performer, composer/songwriter, teacher, recording artist, choral director, community organizer, and producer of musical events. She teaches mountain dulcimer classes at the Freight & Salvage Coffeehouse in Berkeley; directs the choral groups Women & Song and the Unconditional Love Choir; organizes and participates in the local dulcimer club, Dulcimer Jammers; leads Circlesinging workshops; and teaches private voice, dulcimer, and songwriting students. Musically versatile, Deborah performs as both a jazz vocalist and as a traditionally-influenced songsmith with her mountain dulcimer. Occasionally, she allows her classical music education to lure her back with a rendition of Pachelbel’s Cannon in D or an Italian aria. In 2012, Deborah released two CDs, bringing her total to five recordings. “Snapshots” consists of mostly original songs inspired by her North Oakland neighborhood and a decade at Jazz Camp West. In this first solo vocalist recording she was joined by jazz guitarist, Mimi Fox. “The Green Man” is a collection of holiday and other traditionally-inspired songs recorded by The DulciMates, a vocal & dulcimer duo with husband, Buffalo. Deborah is the founder and director of the Berkeley Dulcimer Gathering at the Freight & Salvage Coffeehouse. In her spare time, and when the cat allows, she knits.